HOLIDAY ORNAMENTS FOR WHAT’S JUST AROUND THE CORNER! Time for Holiday Ornaments and all that comes with them. Yeah, can you believe it?!? It seems like just yesterday it was Halloween and I was barking up a storm at Trick or Treating characters who were wearing some pretty scary attire. Some of them carried those plastic orange pumpkin head baskets, the kind that are fun to chew on if you can get your paws on one. And now…the Holidays are just around the corner. That means Thanksgiving, Black Friday, Hanukkah, Advent, Winter Solstice, Christmas, Kwanzaa, New Years, Three Kings Day, and more Holidays…woof! That’s a lot of decorating, getting together, eating, drinking, gifting, barking, howling, ornaments and so on. Not to mention a bunch of really ugly sweaters. However, I do like the way people bring trees inside. I like trees. All dogs like trees. So…here’s an idea for you. 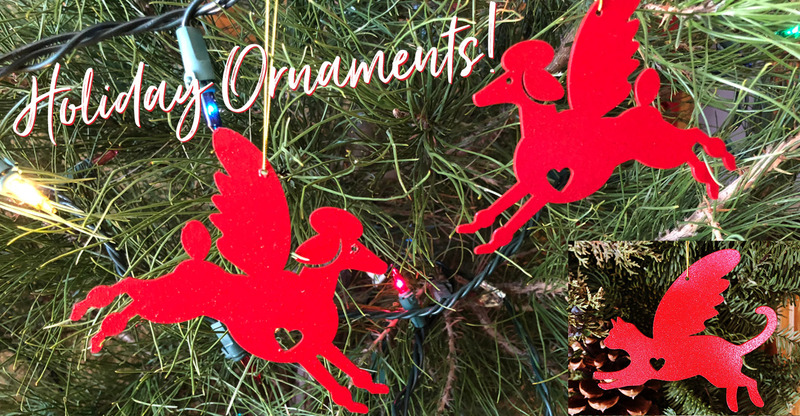 My hooman pals here at OMG have made some cool Pet Ornaments for you to share over this year’s Holidays. You’re welcome. Yep. Just like the ones that they made last year; yeah, the cool ones that pretty much sold out. Those Holiday ornaments. Speaking of Holidays, did you know there’s a National Hum Bug Day? Who knew? Maybe that Hum Bugger person shows signs of being no fun, but you know that deep inside they really are. They’re cool. They sound like a cat person. I bet they’re a cat person. Check out the Cat Ornaments, I think those’ll bright up their smile. Sorry, no remedy for that ugly sweater though. At least they can smile, right? These ornaments make great personalized pet gifts for your friends, family, or for your own tree or home. I’ve seen some pet lovers hang them over certain areas and treat them as mistletoe to get a kiss or two around the Holidays. Sheesh…all you had to do was ask! Anyway, these Holiday ornaments show up in a variety of breeds this year and are available in glittery red or sparkly copper. They’re fun, sort of like me. Fun. Plus, these Holiday ornaments will look great on your tree, in front of your window or hanging from a wreath. I bet they’d look good on a reef on the beach too! Celebrate your little 4 legged friends with your hooman pals! With the Holidays around the corner, you can wrap a pet angel ornament with a Milk-Bone™ and you can cross that person off your list. Also, egg nog and tequila is also a good combo; kinda makes you feel like you’re one of many Holiday ornaments too. But that’s another story. 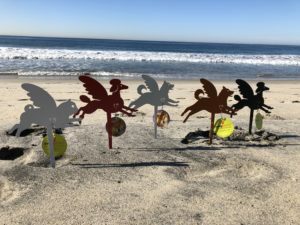 And while you’re in the Holiday shopping mode, check out the pet art and the Pet Angels on the site as well. There are mobile angels and some garden stakes as well. Great gift ideas for gardeners and plant lovers. Yep, the Holidays are just around the corner and my poodle love is cool and as always, large and in charge! Your Lovable Guardian Angel Pal!